Our local newspaper today had an article about a fundraiser held at a nearby school that Melissa Hamilton, one of the cookbook authors of the series, " Canal House Cooking", attended. She, along with Christopher Hirsheimer are the team responsible for this food journal published three times a year. I've seen the books around town, as they are local women but I've never actually bought one (sorry ladies!). 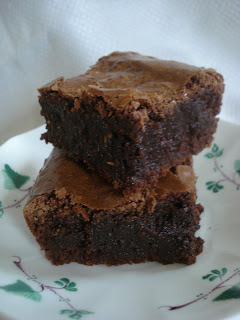 But the brownie recipe in the paper today sounded pretty darned good so I had to give it a try. 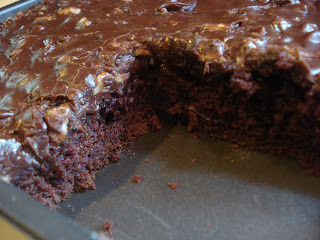 It turned out to be a fudgy dense chocolaty and quite delicious brownie! I may have underbaked it a bit ( which I often seem to do with brownies...for fear of overbaking them! Go figure!) 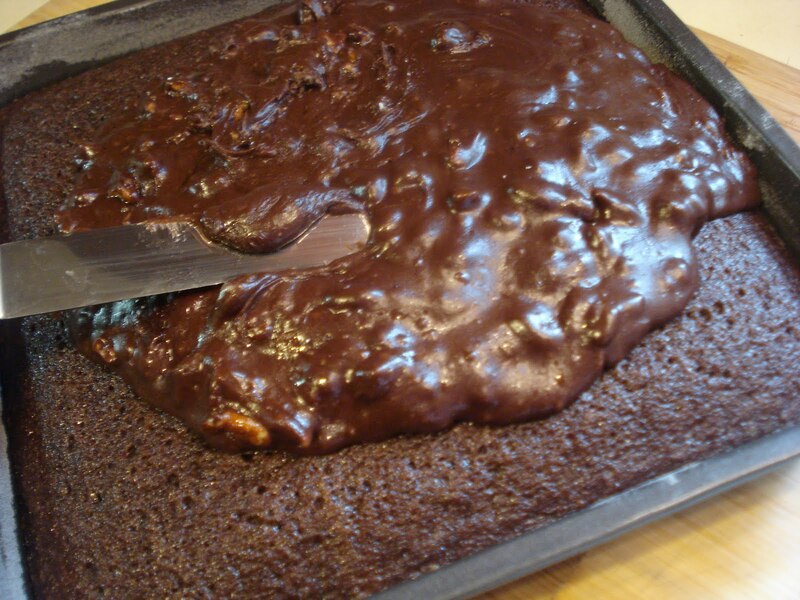 But some people love underbaked brownies. I did pop them into the fridge and they tightened up a little and tasted even fudgier. 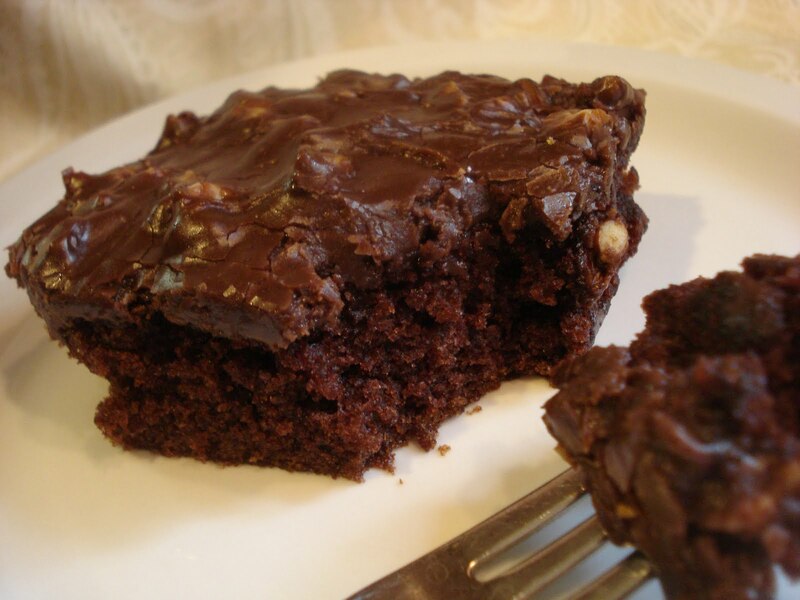 I also love the espresso powder in them which brings out a more chocolaty flavor. The top crust is shiny and tissue paper thin as noted in the recipe. These are just the best and definitely worth every calorie! 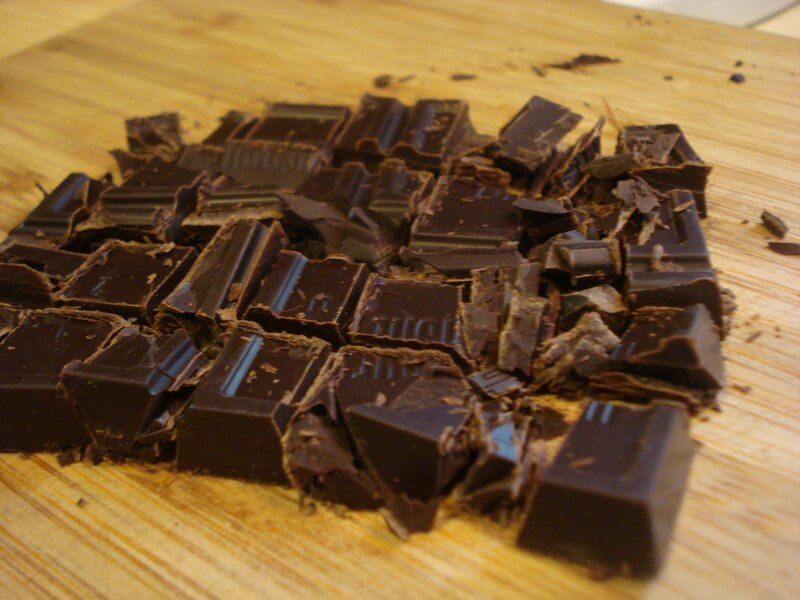 Chop up the chocolates before melting with the butter and sugar. Then stir the mixture together til it's all combined and melted. 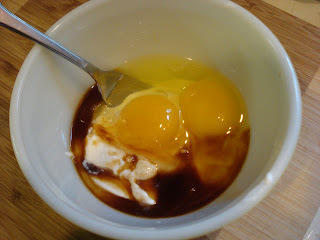 Slowly add the chocolate mixture into the eggs, a little at a time, beating all the while. Add in the vanilla, then stir in the flour, stirring just til combined. Pour the batter into your prepared pan and bake for 45 to 60 minutes. It looks like a lot of batter (and it is) but it didn't overflow. Preheat the oven to 350. 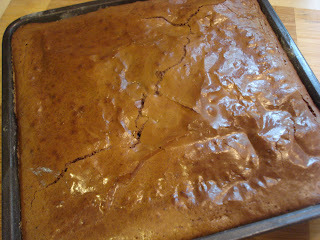 Butter a 9" square pan with 2 tbsp. of butter then dust with flour and tap out any excess. (I thought the butter amount was a little excessive so I only used about a generous teaspoon. 1. Melt the remaining 12 tablespoons of butter in a medium saucepan over medium heat. 2. Add the sugar, stirring til it has the consistency of very soft slush and just begins to bubble around the edges of the pan, 1 to 2 minutes. 3. 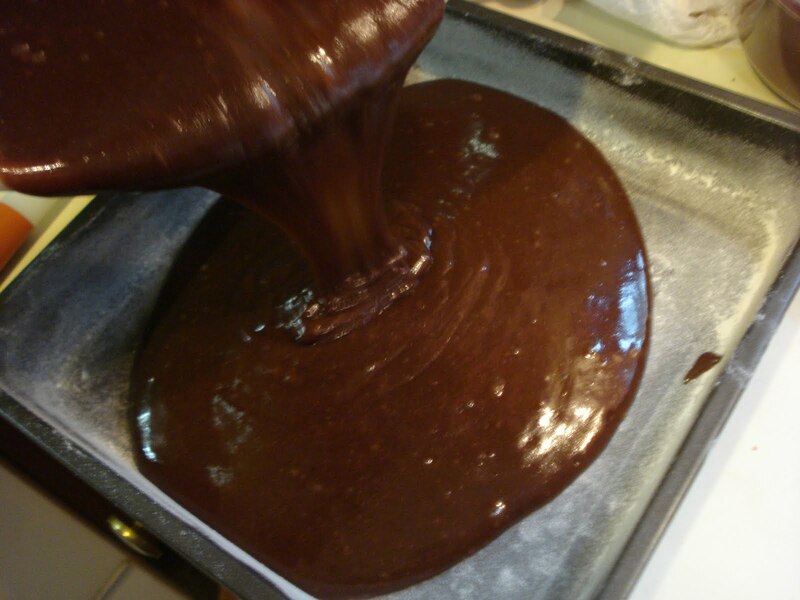 Remove the pan from the heat and add the chocolates, espresso powder, if using, and salt, stirring until the chocolate melts completely. 4. 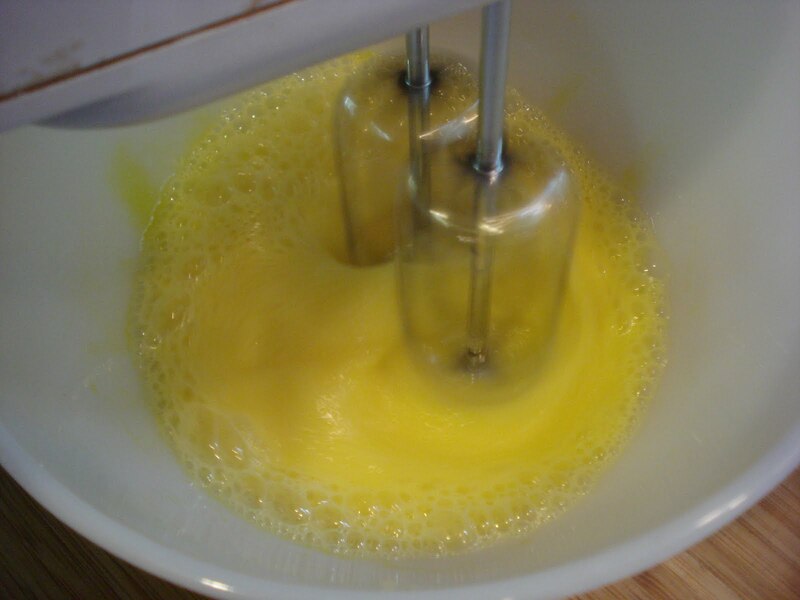 Put the eggs in a medium mixing bowl and beat them at medium speed with an electric hand held mixer. 5. 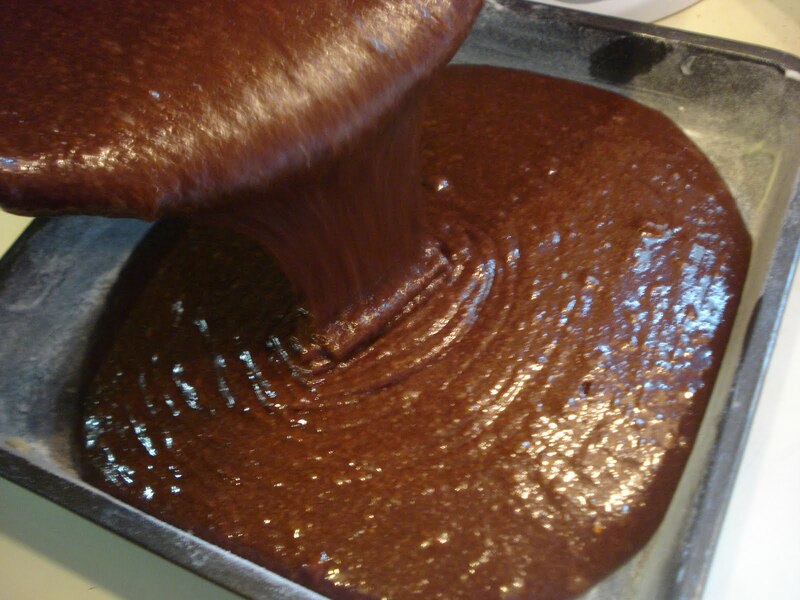 Gradually add the warm chocolate mixture, about a quarter cup at a time, beating constantly til smooth. 7. Add the flour and walnuts, if using, stirring til just combined. 9. Bake 45 to 60 minutes, or til a toothpick inserted into the center comes out clean. 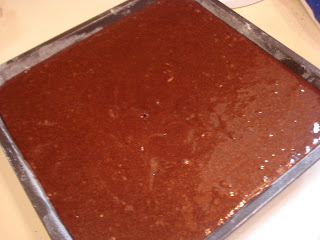 Put the pan on a wire rack to cool, then cut into squares. 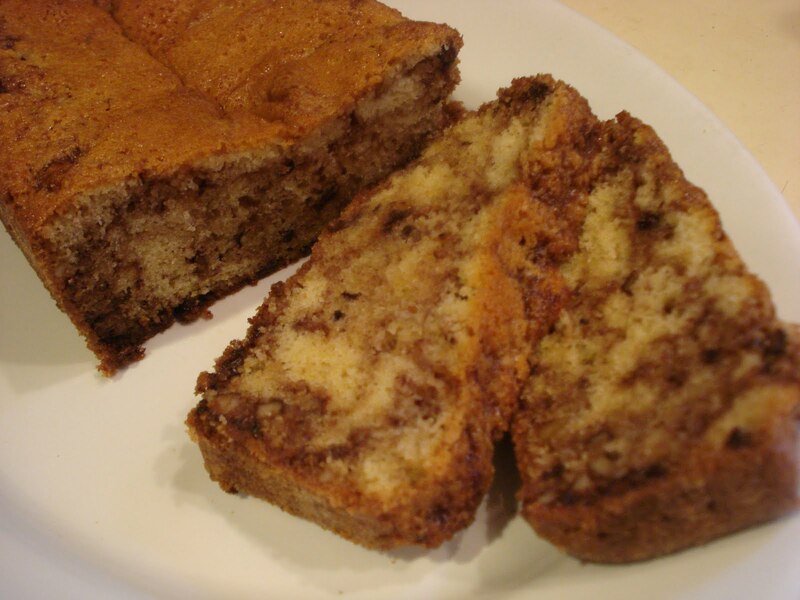 This pound cake comes from the book," Baking at Home with The Culinary Institute of America" and it's a wonderful cake, moist with a tender crumb that comes from using cake flour rather than all purpose flour. I have to mention one thing about this book that I love is that in the back of the book are charts for weights per cup for all kinds of things such as different flours, nuts, herbs, chocolate chips and so much more. I found this so helpful when determining how much a cup of cake flour, for example, weighs. I love using a scale rather than scooping a cupful of flour into a cup measure and hoping for the best! And after reading the loaf pan dimensions and volume for each I determined...I need to buy a smaller loaf pan! This recipe calls for an 8 1/2" loaf pan and I used a 9" loaf pan. Now according to the book an 8 1/2" loaf pan holds 6 cups and my 9" loaf pan holds 8-9 cups. Quite a difference! And the correct size loaf pan would have probably given me a cake the actually rose in the middle. This is what, most likely, resulted in my cake sinking in the middle. But it still tasted great. So there you have my baking lesson for the day learned from my mistake for the day! Sift or whisk the dry ingredients in a medium bowl and set aside. Then in a mixing bowl, cream together the butter and sugar and salt on medium speed, scraping the bottom and sides of the bowl occasionally, for 4 to 5 minutes. While that's beating, in a small bowl, whisk the eggs, sour cream and vanilla. 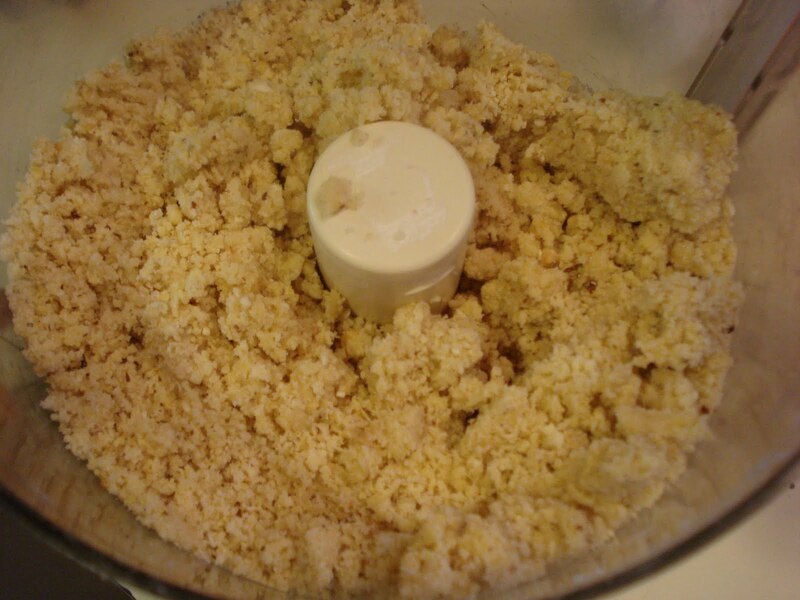 Also in a small bowl stir together the streusel mixture. 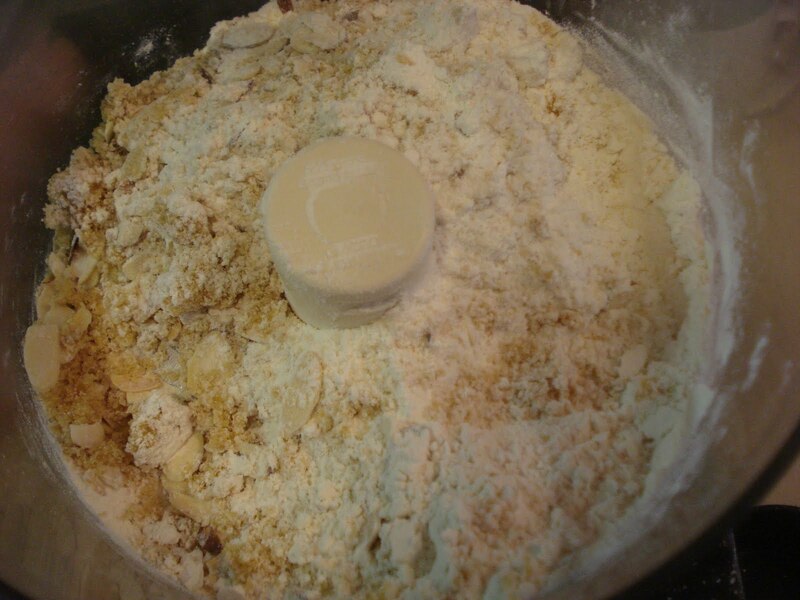 Add the egg mixture, alternating with the dry mixture, then pour half the batter into your prepared loaf pan. And sprinkle the remaining streusel mixture over top. I swirled it with a knife but that's really not necessary. Once it bakes it all comes together anyway! Bake to 50 to 55 minutes. 8 tbsp. ( 1 stick) unsalted butter, room temp. plus extra for greasing pan. 1. 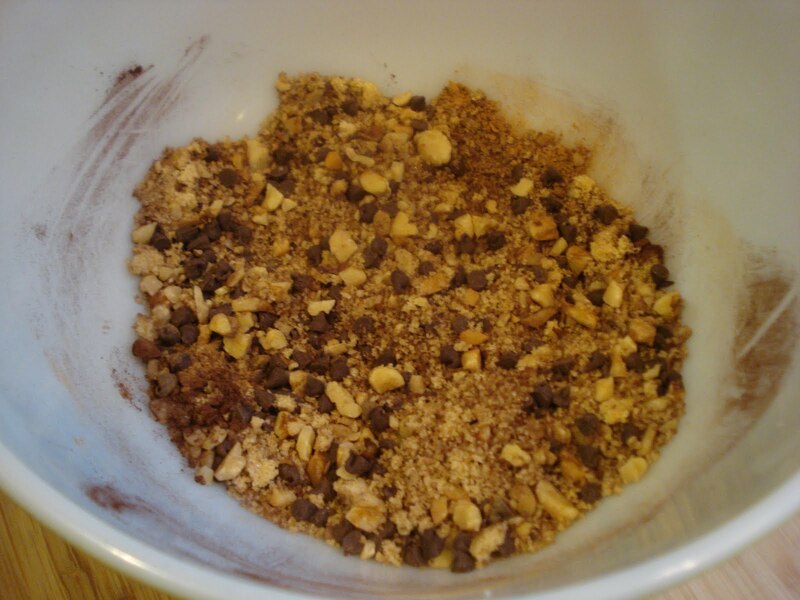 Prepare the streusel by combining the brown sugar, walnuts, chocolate chips , cocoa powder and cinnamon in a small bowl. Set aside. 2. Sift or whisk the cake flour, baking powder and baking soda together in a small bowl. Set aside. 3. 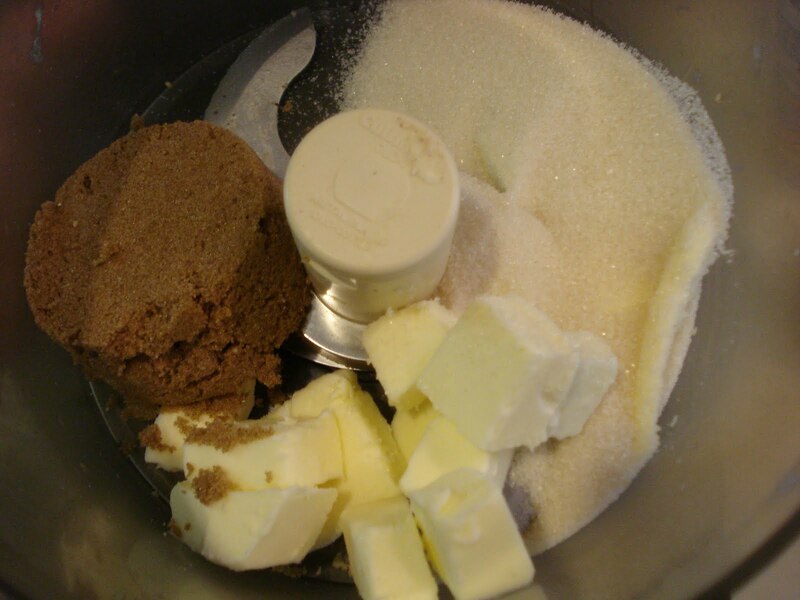 In a mixing bowl, cream the butter, sugar and salt on medium speed, scraping the bottom and sides of the bowl as needed, til the mixture is smooth and light in texture, 4 to 5 minutes. 4. In a small bowl, blend the sour cream, eggs and vanilla. 5. Add the egg mixture to the butter mixture in 3 additions, alternating with the dry mixture. 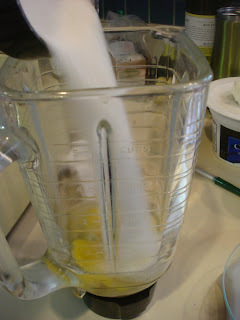 After the last addition of the egg mixture, mix on low speed til just blended, scraping down the bowl as needed, one minute. 6. 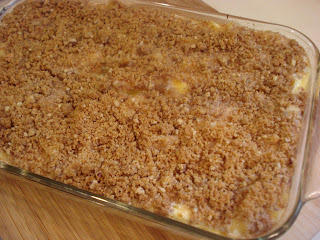 Pour half the batter into the prepared pan and sprinkle half the streusel mixture over top. 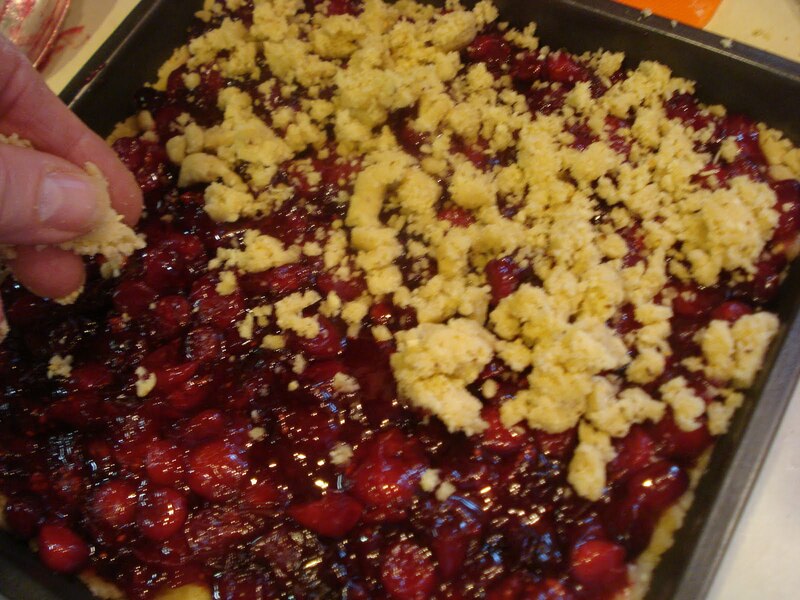 Spoon remaining batter into the pan and sprinkle the remaining streusel over this. Swirl with a knife. 7. Bake 50 to 55 minutes, or til a skewer inserted into the center comes out clean. 8. Cool the cake completely in the pan on a wire rack. 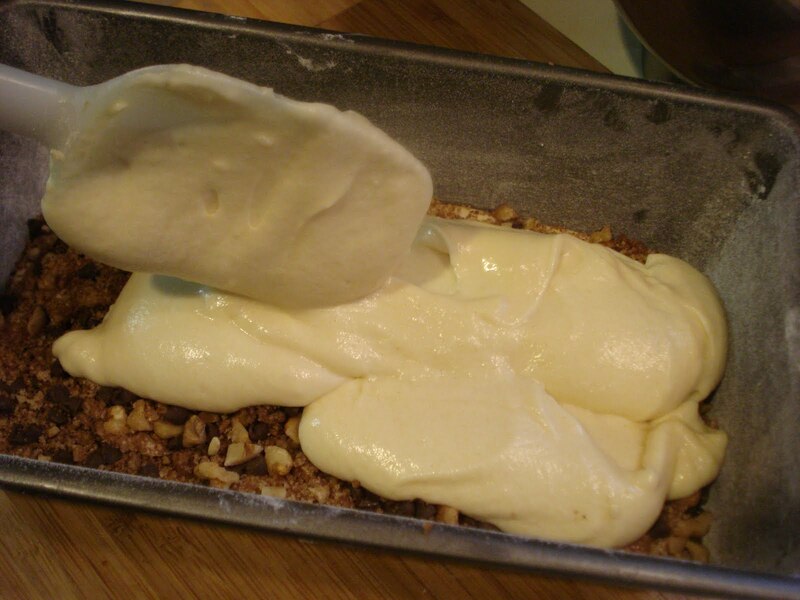 Then release the sides of the cake with a knife or metal spatula and unmold. Slice the cake at room temperature. 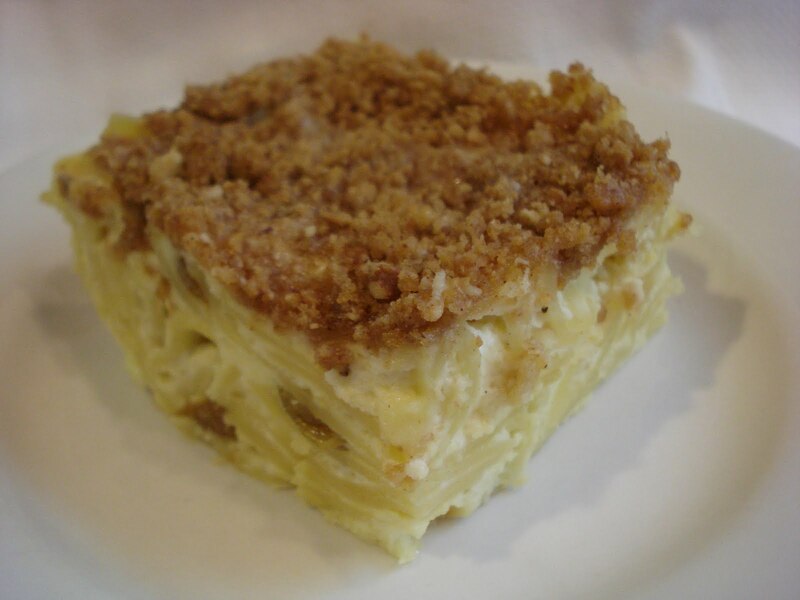 Yes, this really is the best noodle Kugel! And, yes, there are lots of recipes out there for noodle kugel but I never need to try any of them .... I have always made what we here think is the best. This is a family recipe I learned from my mother-in-law, Lil. You remember her from these. Well this kugel has been made in this house for well over 30, (ok, almost 40 years!) and it's always a welcome and comforting dish, no matter what season or holiday. And it's so easy to throw together. 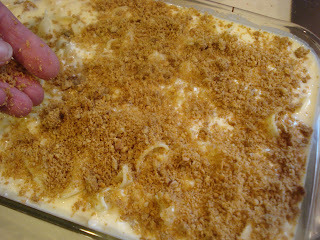 The graham cracker crumbs sprinkled on top give the dish an added crunch... the creaminess going on from all the dairy in there...and then the white raisins adding a bit of tang. Can you tell I love it! The only other thing needed would be a dollop of sour cream. I really hope you'll give it a try. This recipe makes enough for an 11 x 7 inch baking dish but for a larger crowd just double it and you'll have a lot of happy people! Put the eggs and sugar into a blender and give it a whirl. 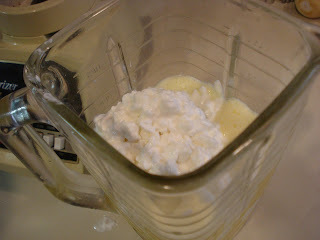 Then add in the cream cheese, cottage cheese and sour cream and give that a spin. Boil the noodles and drain them ( but don't rinse them), then stir in the butter til it melts. Into the pot with the noodles, stir in the egg, sugar and cheese mixture. 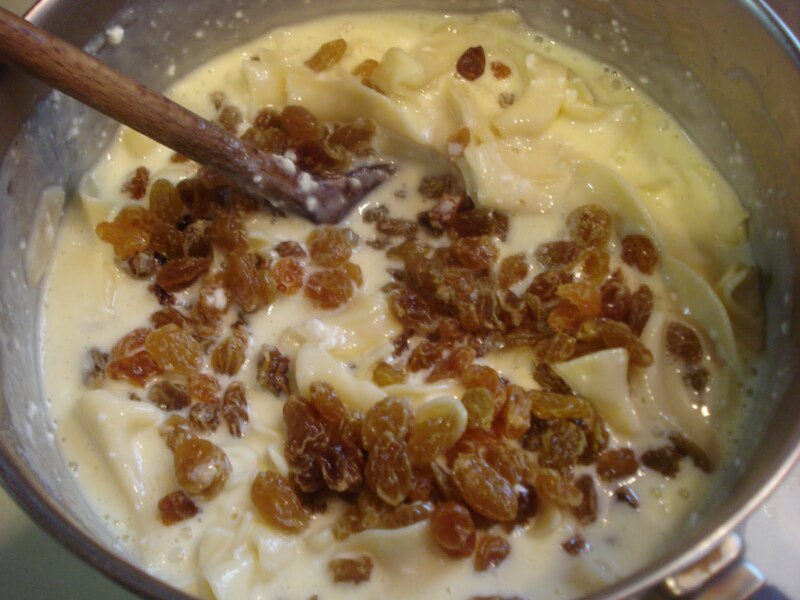 Throw in the white raisins and stir it all to get it well mixed. Pour the mixture into a baking dish or casserole dish and sprinkle the top with the crushed graham crackers, then a little sugar over that. Bake for between 30 and 40 minutes (depending on your oven). 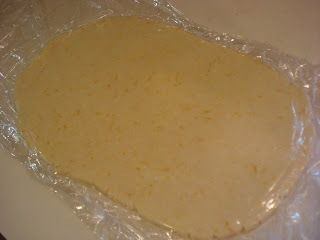 The kugel should be still a little wet and it will continue to set after it comes out of the oven. Let it sit for about 20 to 30 minutes before cutting. 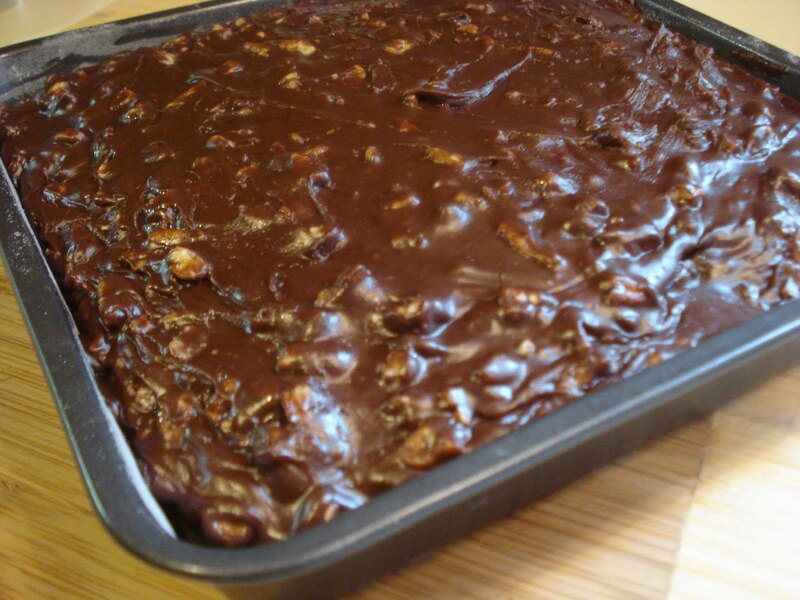 For a larger crowd, double the amounts and use a 13 x 9" glass dish. Sugar (for sprinkling over the top), approx. 2-3 tbsp. Preheat oven to 350. You will need an 11 x 7" baking dish. ( I never bother to butter it and it never sticks). 1. Put the eggs and sugar into the blender and give it a spin to combine. 2. Add in the cream cheese, cottage cheese and sour cream and blend to combine. 3. 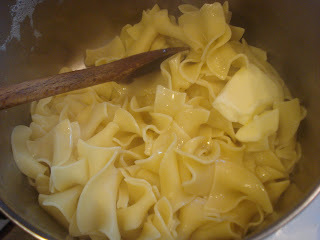 Meanwhile, boil the noodles til slightly underdone ( al dente) and drain off the water but don't rinse them. 4. 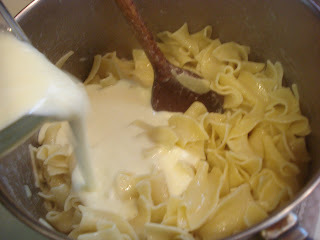 Add in the butter and stir til the butter is melted with the noodles. 5. Pour in the egg/sugar/cheese mixture and stir it well. 6. Stir in the raisins, then pour the mixture into your baking dish. 7. 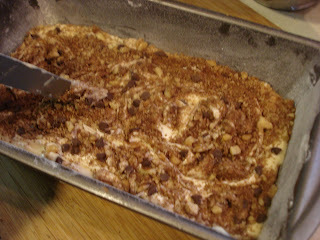 Sprinkle the top all over with the graham cracker crumbs, then sprinkle the sugar over the crumbs. Try to make sure all the noodles are under the crumbs so they don't dry out while baking. 8. Bake for between 30 and 40 minutes, or til the kugel looks set but still slightly moist as it continues to set after it comes out of the oven. 9. Let it set up before cutting for about 20 minutes or so. It's always best served warm just out of the oven. It can be reheated, wrapped in foil and placed in a warm oven. It's also great cold! 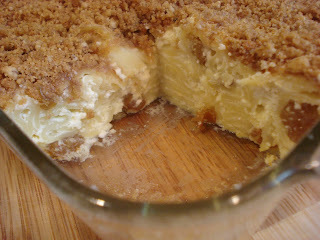 Buttery...crumbly...light...amazing! 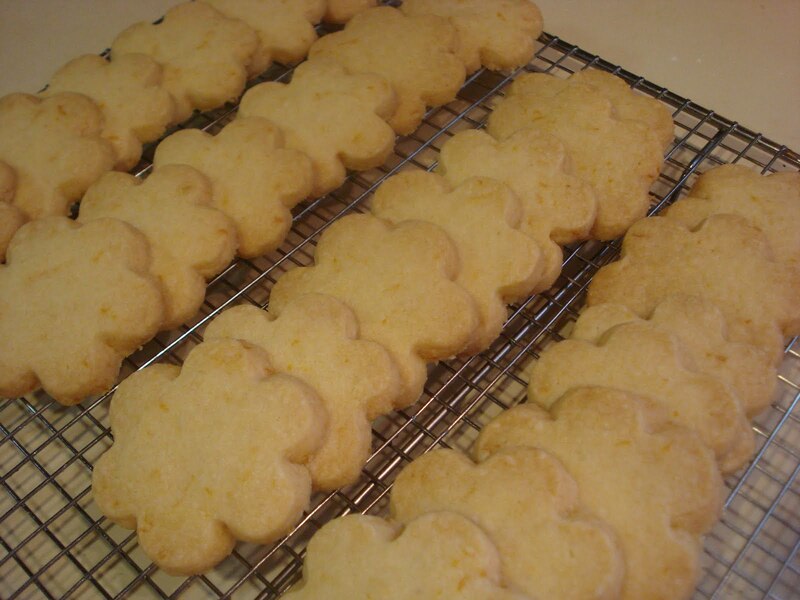 These shortbread cookies are sooo good. With Easter fast approaching I thought a light citrus cookie would be perfect. These are exceptionally light from the cornstarch and confectioners' sugar in the dough. They melt in your mouth! 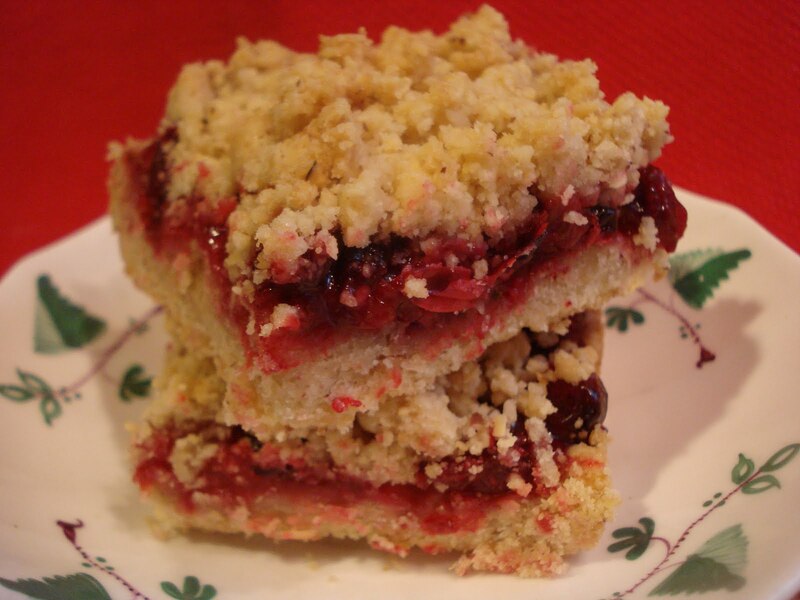 The recipe came from a book titled, " Baking at Home with The Culinary Institute of America". It's a wonderful book with lots of great photos and tips for baking. I chose to make them into cut out cookies but you could also make the shortbread in a prepared mold. Hope you'll give these a try. You will love them. 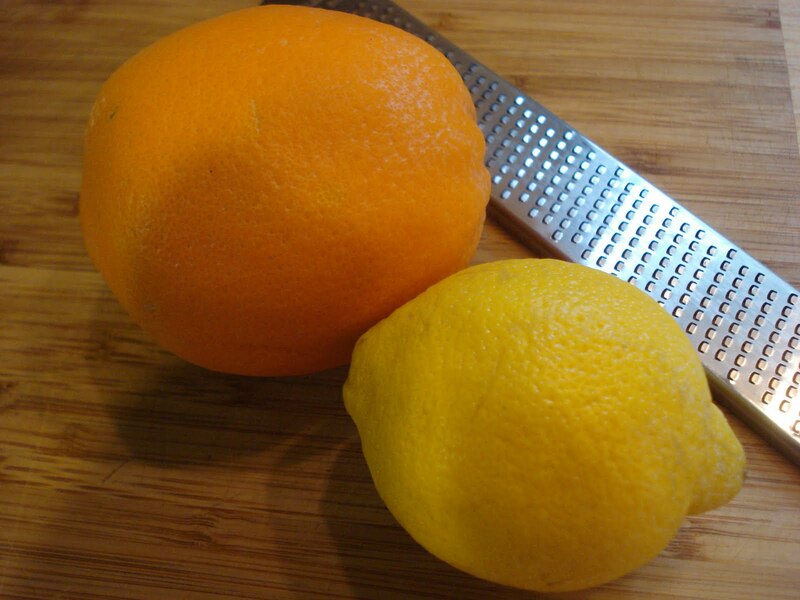 You'll need zest from an orange and a lemon. Because I cut out the cookies, I rolled out the dough between two pieces of plastic wrap and refridgerated it for about 30 minutes to let it get nice and cold and easier to cut out the shapes. And place them on a cookie sheet and bake for about 20 minutes. 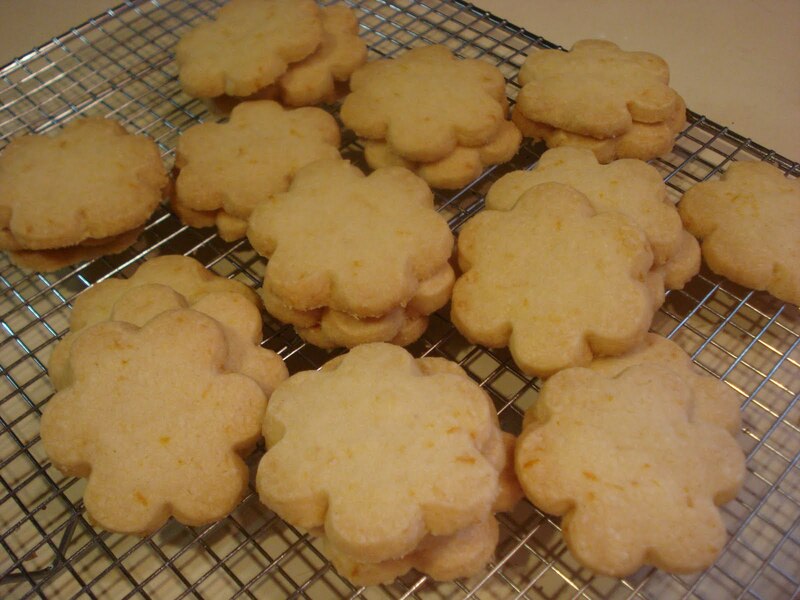 Citrus Shortbread Cookies ( from Baking at Home, With The Culinary Institute of America"). 1 1/2 cups(3 sticks) unsalted butter, room temp. 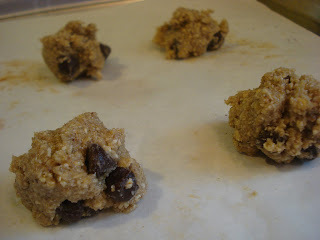 The book says to lightly spray cookie sheet with cooking spray or line with parchment but I found just a light sprinkle of sugar on the sheet was enough to keep them from sticking. 1. Sift the flour, cornstarch and salt in a medium bowl and set aside. 2. In a stand mixer fitted with the paddle attachment, cream the butter on medium speed til light in texture and smooth, 2 minutes. 3. Add confectioners' sugar and the orange and lemon zests: cream til light and smooth, scraping down the bowl with a rubber spatula as needed, about 2 minutes. 4. On low speed, mix in the sifted dry ingredients til just blended. Scrape down the bowl as needed during creaming and mixing to blend evenly. 5. Place the dough on a piece of plastic wrap and shape into a disc, then cover with another piece of wrap and roll out the dough to 1/4" thickness. 6. Place in the fridge for about 30 minutes, or til firm enough to cut out shapes. 7. 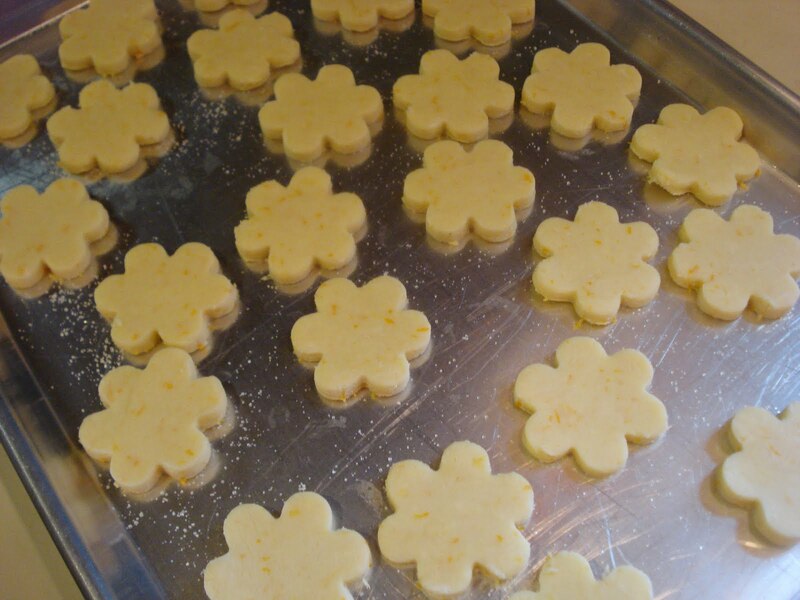 Preheat the oven to 350 and take the dough out of the fridge and cut out the shapes, placing on the prepared cookie sheet. Reroll any scraps. 8. Bake for about 20 minutes or til the edges are light brown. ( I always check the bottom of one to be sure they're a light golden brown. I like them a little crunchy). They harden as they cool. For a special celebration tonight I felt like baking something extremely chocolaty and I remembered this cake recipe I'd wanted to try since I bought this book, "The Spice Kitchen" a while back. I noticed similar recipes floating around the internet..some called Texas Sheet Cake and one very similar from here but because this recipe is out of a spice cookbook it has some extra "kick" from the cinnamon and ancho chili pepper in the frosting. It's a very quick and easy recipe to make and you don't even have to haul out the mixer. Just one large bowl and a saucepan is pretty much all you need...well, okay, a few spoons and a whisk help, too! 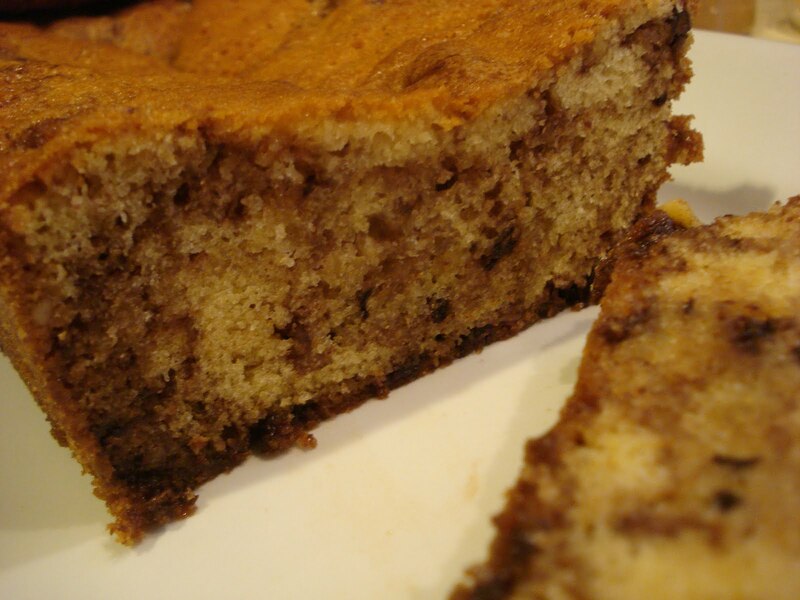 The cake is moist and very chocolaty. I used Valhrona cocoa powder which is a great quality cocoa to use and always makes baked goods taste so good. But I really think Hershey's would be fine, too. And because we're a small family, I halved the recipe and used a nine inch cake pan. And why is it called a sheath cake? Apparently no one knows for sure! 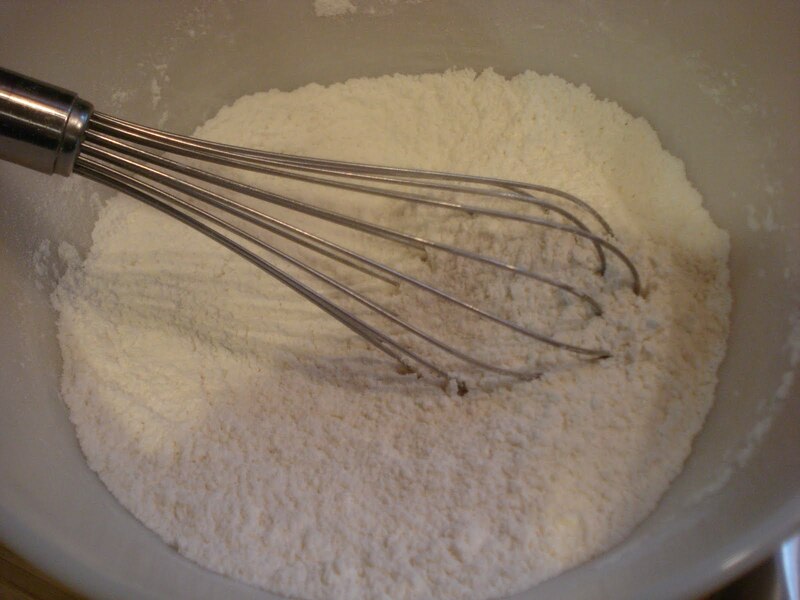 Whisk your dry ingredients in a large mixing bowl. In a glass measuring cup, beat together the eggs, buttermilk and vanilla. In a medium saucepan, combine water, butter, oil and cocoa powder and bring to a boil. Pour the boiling cocoa mixture into the flour mixture and stir to combine. Add the egg mixture and stir that well. Pour the batter into your prepared pan and bake for about 20 minutes, or til a tester inserted into the center comes out clean. Five minutes before the cake is finished baking make the frosting by combining the butter, milk, cocoa, vanilla, cinnamon and chili pepper in a medium saucepan. Bring to boil over high heat, whisking constantly. 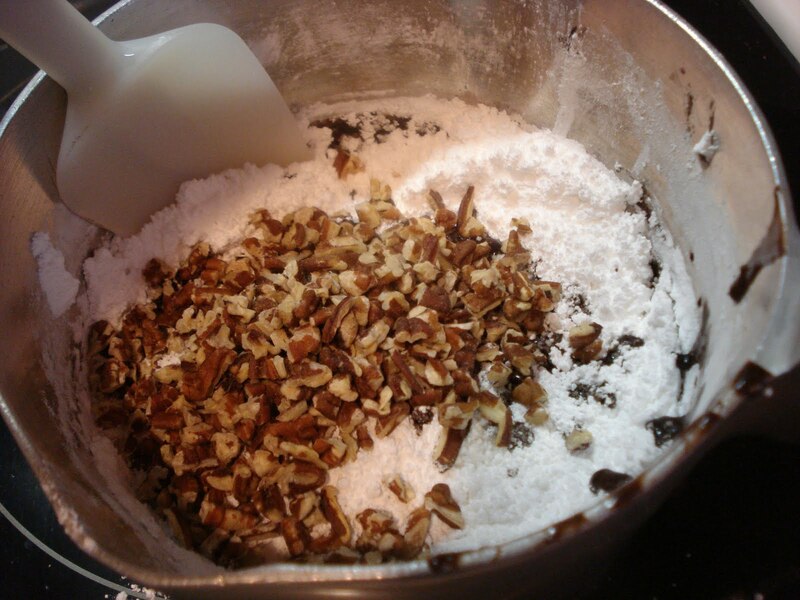 Remove the pan from the heat and stir in the confectioners' sugar and chopped pecans. Spread the hot icing over the hot cake. Then see how long you can hold out before you cut into it! Preheat oven to 400. Grease and flour a 13 x 9 x 2 inch cake pan. 1. 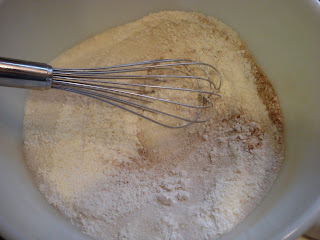 Sift or whisk flour, sugar, cinnamon and baking soda in a large mixing bowl. 2. 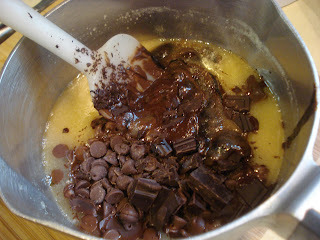 Combine water, butter, oil and cocoa powder in a medium saucepan and bring to a boil over high heat, whisking constantly. 3. 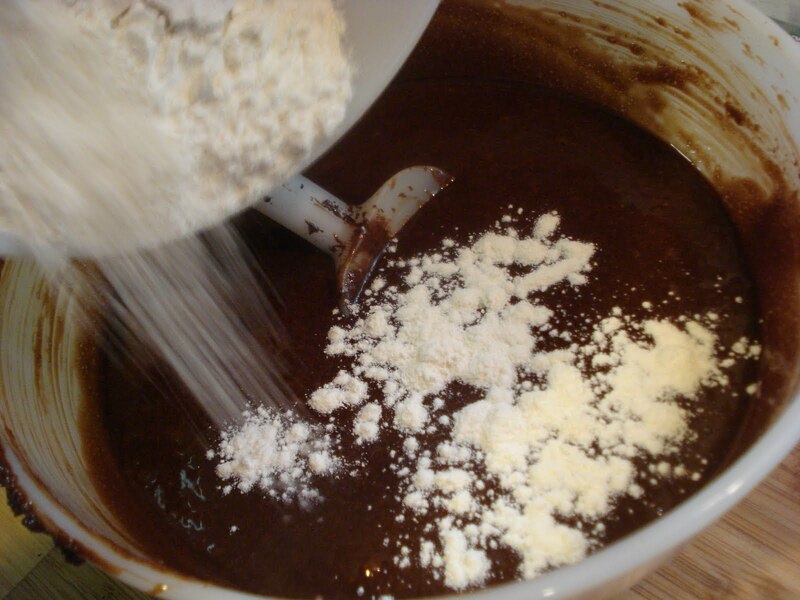 Pour the hot cocoa mixture into the flour mixture and mix til combined. 4. 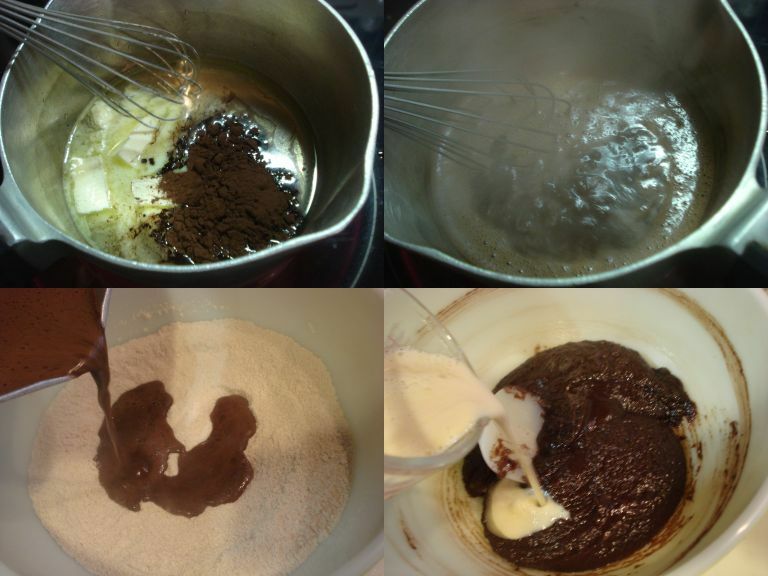 In a small glass measuring cup beat together the buttermilk, eggs and vanilla and pour into the chocolate batter and mix well. 5. Pour the batter into the prepared pan, dropping the pan a few times on the counter to get rid of air bubbles. 6. Bake for about 20 minutes, or til a tester inserted into the center comes out clean. 7. Five minutes before the cake is done, begin making the frosting. 1. Combine butter, milk, cocoa powder, vanilla, cinnamon and chili pepper in a medium saucepan. 2. Bring to a boil over high heat, whisking constantly. 3. Remove the pan from the heat and stir in the confectioners' sugar and chopped pecans. 4. Spread the frosting evenly over the hot cake. I couldn't wait to try another recipe from this book "Rustic Fruit Desserts" since the other recipe was so delicious. So I decided on this one...with a few changes, that is. In the book this is really called Cherry Almond Bars but I didn't have any cherries so I switched out and used another red fruit, cranberries. Since cranberries are tart I had a feeling I should be adding more sugar to the fruit filling but I decided to leave it with the original amount called for. 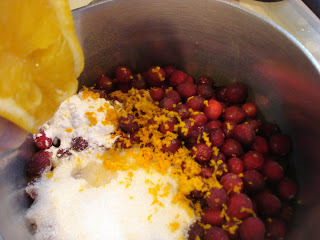 I did switch lemon for orange, since I love the combo of cranberries and orange. The bars came out great, although there was a half cup of crust dough left over that I didn't use ( pop any extra into the freezer to use as a crumble topping for something else later). I think if I had made this in a little bit larger pan I would have used all the dough...next time! If you notice the photo below, it doesn't have the white chocolate drizzle. 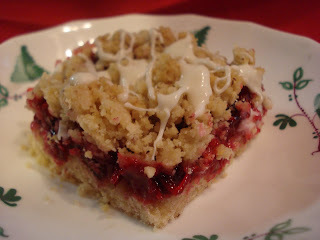 After I cut and tasted the bar, I realized I should have increased the sugar amount to compensate for the tartness of the cranberries. But...I fixed the sweetness problem with melting and drizzling the white chocolate over the top. It added just enough sweetness. So you can use the half cup sugar amount given and drizzle the white chocolate or increase the sugar and skip the drizzle...or do both! Can't be bad...right? Begin by making the fruit filling by combining the cranberries, sugar, cornstarch, salt, orange zest and orange juice in a medium saucepan and bring to a boil over medium high heat. Once it boils, stir the mixture and let it cook a few minutes til the cranberries pop and cook down a bit. Then transfer the mixture to a bowl to cool. 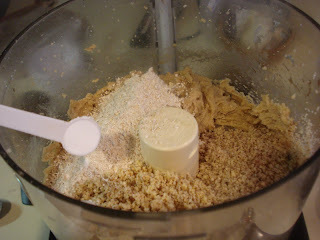 For the crust, combine the flour, brown sugar, almonds and salt in a food processor. 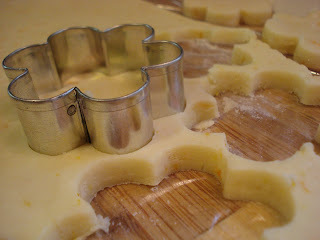 Add in the cold butter pieces and process til crumbly. Til the mixture comes together. 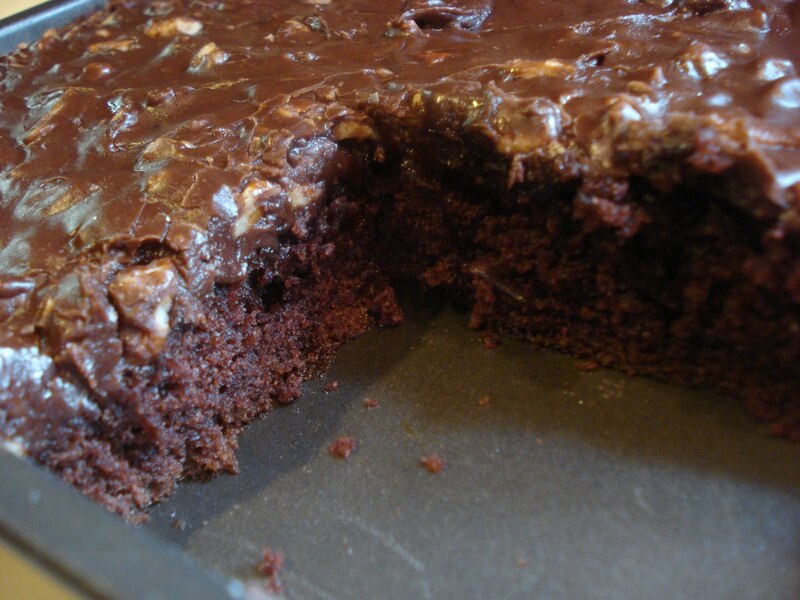 Press two-thirds of the crust mixture into the bottom of the pan and pour the filling over top. Press clumps of the remaining crust mixture over the filling. Preheat oven to 350. Butter bottom of 9" pan. 1. To make the fruit filling: Combine the cranberries, sugar, cornstarch, salt, orange zest and orange juice in a saucepan over medium heat. Bring to a boil, stirring occasionally, and boil a few minutes til the cranberries pop and the mixture begins to thicken. 2. 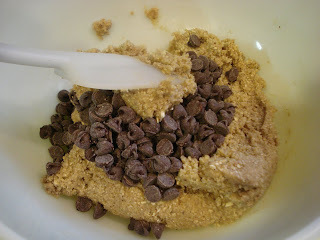 Transfer the mixture to a bowl to cool and set aside. 3. 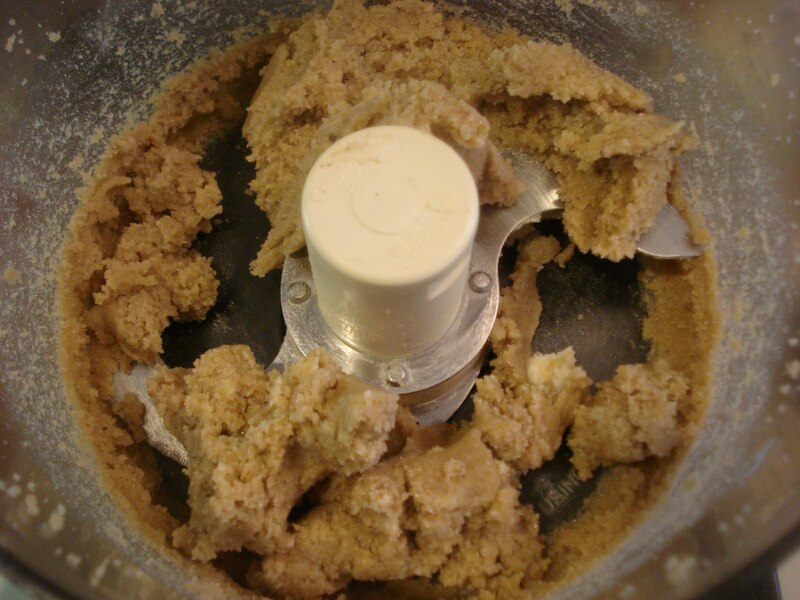 To make the crust and topping: Combine the flour, brown sugar, almonds and salt in the bowl of a food processor. 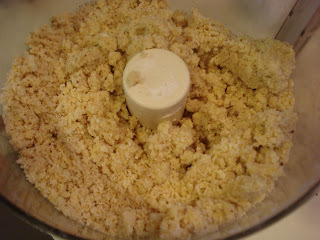 Add the butter and process til crumbly. 4. 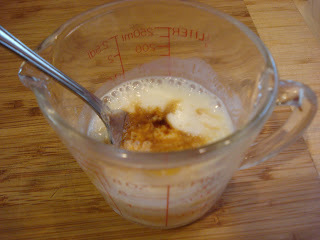 Add the egg and vanilla and pulse just til the mixture comes together. 5. 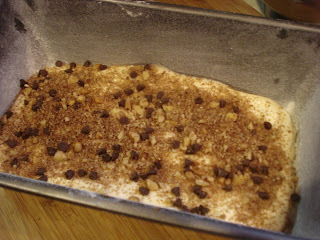 Press two-thirds of the mixture into the bottom of the prepared pan, then pour the filling over top. 6. Press clumps of the remaining crumb mixture over the fruit filling. 7. Bake 30 to 35 minutes, or til light golden brown and bubbling. 8. Cool one hour before cutting into serving pieces. Drizzle with the melted white chocolate if you like. The weather's warming and the Farmer's Market season will be starting up soon..yeah! I have begun to set up at a local flea market selling my cookies already and the one question, or rather, comment, I get alot is about gluten free cookies. 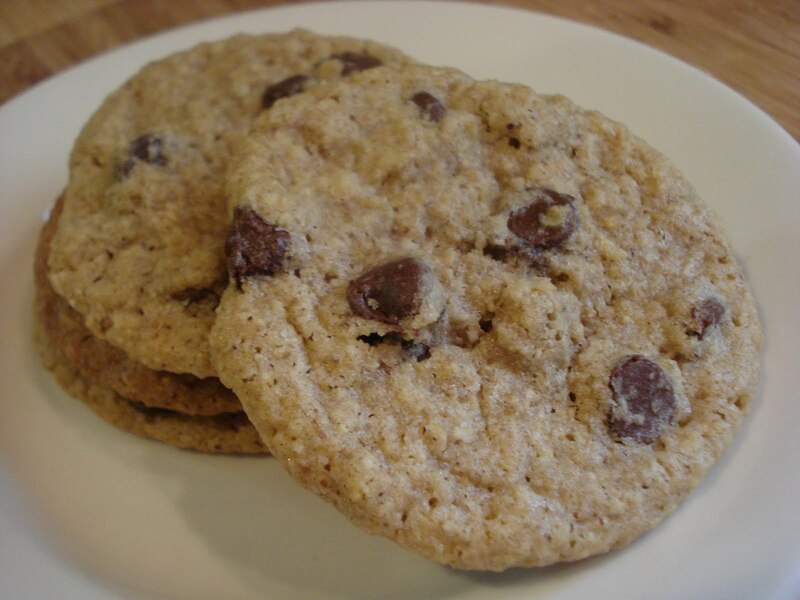 I came across this Nutty Oatmeal Cookie recipe and what I immediately liked about it was the ingredient list. I doesn't call for a lot of different kinds of flours that I don't have in the house, such as tapioca flour, millet flour or potato starch. I uses just the flour made from old fashioned oats, almonds and hazelnuts. And I love that it's a quick recipe to throw together (provided you have a food processor). I hope you'll read the story that goes along with this cookie recipe. I'd love to try some other recipes in the book sometime. 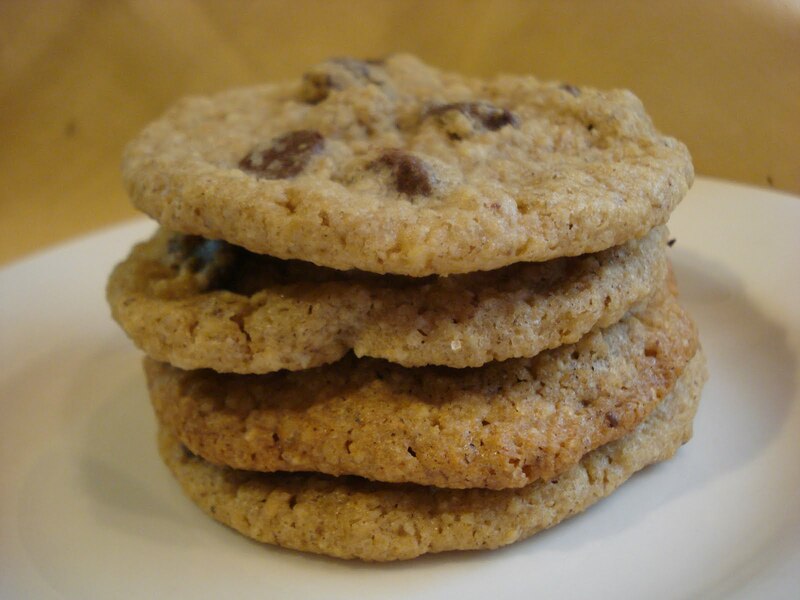 As for the cookies, they're crunchy and have a wonderful nutty flavor. The chocolate chips add just enough chocolate and even though I'm not gluten intolerant I'd make these cookies again...just for me us! Til the mixture is smooth. 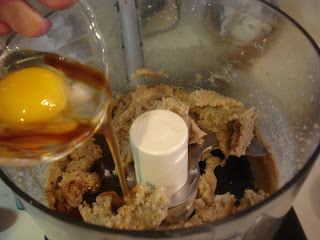 Then add the egg and vanilla and process til well combined. Transfer the mixture to a large mixing bowl and stir in the chocolate chips. Drop the dough by teaspoonfuls or tablespoonfuls ( depending on what size cookie you'd like). Bake about 15 minutes, or til the edges begin to brown. 1 stick (4 oz.) unsalted butter, room temp. *To make flours: You'll need a food processor to make your own flours from the oats and nuts. Place the oats into the bowl of a food processor and pulse til the oats have a flour consistency. Place the nuts in the bowl of a food processor and pulse the nuts just til they have a fine consisitency. Don't overpulse. You don't want to make a paste! 1. 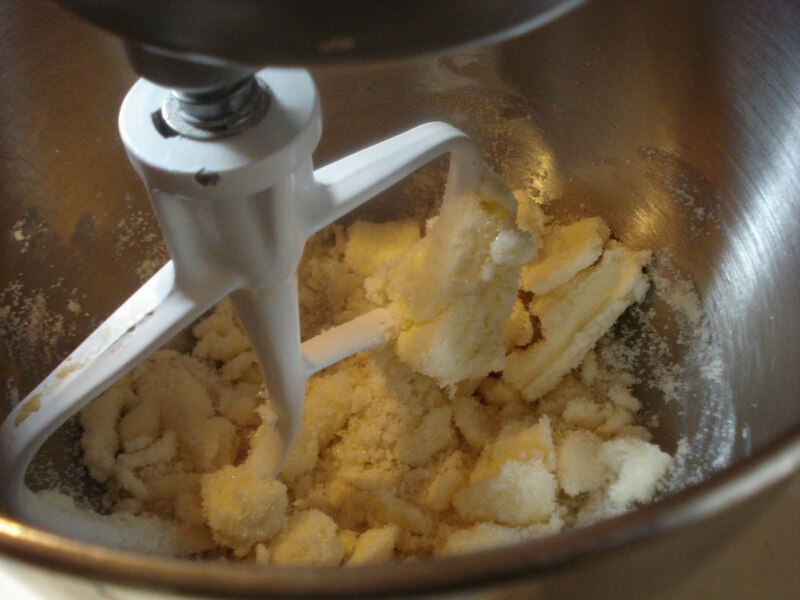 Combine butter and sugars in a food processor and pulse 20 to 30 seconds, til smooth. 2. Add the egg and vanilla and process til well blended. 3. 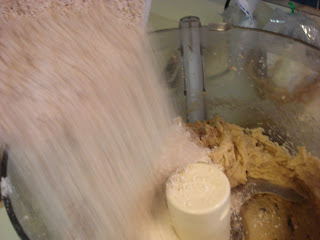 Stop the motor and add the flours and baking powder and process to mix well. 4. Transfer mixture to a large mixing bowl and stir in the chocolate chips. 5. Drop by teaspoonfuls or tablespoonfuls spacing 2" apart. 6. Bake 15 minutes, or til the edges begin to get a light brown. 7. Cool on baking sheet 2 to 3 minutes, then transfer to a wire rack.